I haven’t had the chance to do much leaf peeping this year except for right around my own neighborhood. It’s very pretty, though, so on Monday afternoon I took a walk to the Town Common and I snapped these photos for you. Very classic New England, yes? Makes we want to drink hot cider and read Yankee magazine. I think this year is especially beautiful; even I have to admit how pretty it is! Yes indeed quintessentially New England – and quite beautiful. Your photos look like postcards. The colors seem brighter this year. I wonder if it was all the rain we had. Love the colors! 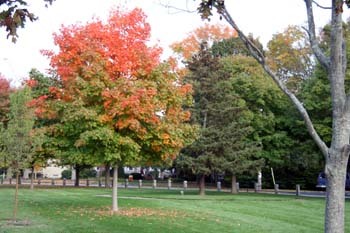 We are just getting some glimmers of color here in CT. I’m going to Rhinebeck on Saturday and can’t wait for the colorful drive – makes me want to knit in those autumnal hues. So pretty! 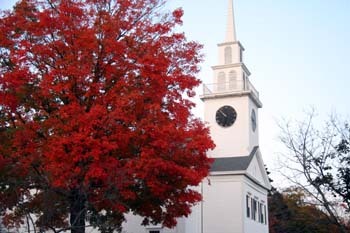 I love that red tree near the church. Only a few of our trees have started to turn, and I’m waiting anxiously for it to happen. Yes it is very New England and very beautiful. Ours haven’t really turned yet but I’m looking forward to it. Lovely! We have some darn fine colors here in the midwest too. All but peaked by now though! Sigh… I heart leaf-peeping. Thanks for the tour. This is really a great place to live. We were at my parents (in central Mass) this past weekend, and I was stunned at the gorgeous foliage. 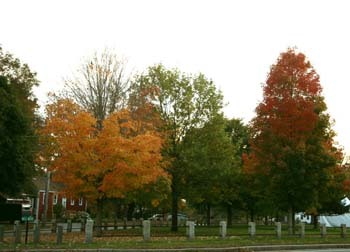 I always enjoyed it before, but didn’t get the whole fuss either, until I moved to a place that has a lame autumn. All my leaf peeping this fall will be what I see on blogs. Thanks for the beautiful pictures! We actually do get a fall here in the Central Valley, but it is much later. And it is during the late fall and winter here that everything gets really green and beautiful. I have new roses on my rosebushes and oranges turning orange on my trees in my backyard! Thank you for sharing part of your town with us, Carole. It’s just beautiful. This year the colors have been amazing. I’ve probably taken at least a hundred pix, none of which fully captures the gorgeosity. I keep trying, though. Very pretty! We drove through Lake George and part of Vermont on Monday – lovely color this year! Bloglines is doing it again…Think I’m switching to Google reader as soon as I have time to set it up. This year has been absolutely awesome with the colors. 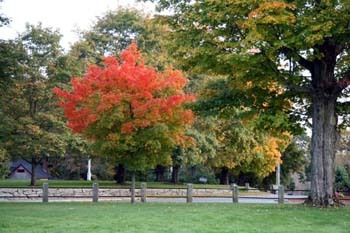 It is the most colorful fall since I moved here – on October 31, 2004. And, I’ve been able to travel and get out and see the colors – it has been so much fun! hello, I popped over from Claudia’s blog, saw the pictures & got all excited, that’s EB common! It has to be! I grew up around that area & miss fall terribly (I’m now in San Diego). I love when they decorate the common for Christmas too. Thank you for sharing wonderful pictures.